Michael Wiegand, CTRS, is a west coast transplant, originally born and raised in Virginia Beach. Growing up in Virginia Beach, Michael spent his summers outdoors at the beach or traveling with friends. He attended school at Longwood University in Farmville, Virginia where he found his calling in the field of Therapeutic Recreation. 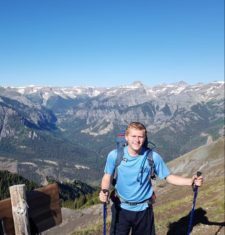 During his internships and schooling, he learned the value and benefits that outdoor recreation could bring to those in need. After receiving his B.S., Michael left the East Coast in search of work where he could combine his passion for Therapeutic Recreation and his love of the outdoors. In the winter of 2017, Michael found Outdoors for All Foundation where he could do both. Michael is an avid enthusiast of having an active and meaningful recreation/leisure life. In his free time, he enjoys hammocking, paddle boarding, soccer, hiking, and is always trying to learn new activities. He hopes to one day further his education so he can open up his own nonprofit to help people rediscover their own recreation.